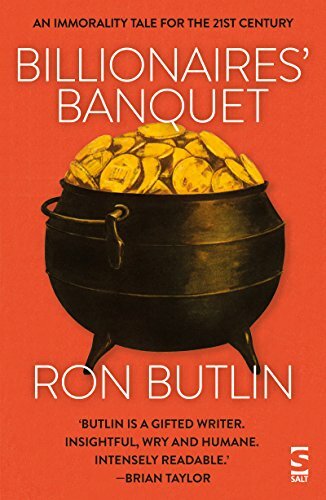 I’m pleased to be sharing an excerpt from Ron Butlin’s Billionaires’ Banquet today. It is published by Salt, an independent publishing company and available now in paperback or as an ebook. A grim autumn afternoon, Scottish-grim. Darkness falling. Grey sky and sagging clouds. Heavy, heavy rain. A cutting east wind. A rawness in the air, a chillness that threatened sleet. Dirty rainwater was puddled in the dips and cracks of the uneven pavement; oily-looking sludge oozed blackly up from between the loose-fitting slabs. Scrunched-up chip-papers and pizza cartons blew the length of the street. He pulled his coat tighter around him and splashed past the small grocer’s, the Taj Mahal carry-out at the corner, then turned into the main street. Shops, shops, and more shops – fruit shop, charity shop, bread shop, vacuum-and-washing-machine shop, another charity shop; past the garage with its forecourt banner snapping in the wind and the blue plastic bags of coal stacked and gleaming wet against the wall; past the bookie’s where the owner stood legs wide apart in the shelter of his doorway, puffing away at an end-of-day cigar while he stared out at yet another Scottish October. Then the Auld Toll pub, the butcher’s, the Yangtse Goodwill, the Co-op, Bennett’s Bar, the King’s Theatre. To Hume, all shops, restaurants, garages, pubs and theatres were no more than the ongoing blur he coasted past every day. They weren’t even on his radar. Most people check they have enough money on them before leaving home, Hume usually checked to be sure he had none. It gave him a sense of freedom, of detachment and independence. Then, for the first time, he saw a beggar on the streets of Tollcross. The beggar was huddled under the tarpaulin awning next to the entrance to the Co-op, trying to keep out the rain. Slumped forward, head down and miserable-looking. Shoulders covered by a torn, mud-spattered blanket, chilled-looking hands clutching each other. Hume had seen street beggars the last time he’d visited London; he’d been told of teenagers down there living in cardboard boxes. He’d been bewildered. Mrs. Thatcher’s new policies were creating new wealth and opportunities, offering everyone the chance to set their own goals and to succeed. But here was someone begging in Edinburgh now . . . and not one of the straggle-bearded, meths-battered down-and-outs that staggered from dosshouse to dosshouse in the Grassmarket. This was a genuine beggar, possibly in danger of starving to death on streets he walked along nearly every day. A young beggar at that. Younger than him even. He was truly shocked. Though frantic to get his hands on a copy of Thought, he was deeply saddened to see someone who’d become one of the all-too-visible wounds of society. Also, on a personal level, it was a warning – if philosophy didn’t start earning its keep, he might find himself setting up his own begging bowl in competition. For the time being, however, his sense of natural benevolence – as described by his namesake David Hume – urged him to offer support and comfort. A show of sympathy at the very least. But was the concept of beggary really so straightforward, were its implications so self-evident? Even the most superficial analysis threw up some very basic questions. For example, if he were to give this beggar a handful of loose change – assuming he actually had any, which of course he hadn’t – would that really help them? In his groundbreaking essay, such behaviour had been categorised as ‘indulging in false compassion’, and the conclusion was irrefutable. Such acts of spontaneous charity achieved nothing except to keep the unfortunate beggar in a state of permanent beggary. This was the only possible inference that could be drawn, he had argued, either empirically or a priori. Such acts of casual benevolence were irresponsible at best and, in the long term, positively harmful. They created dependence and, as a consequence, limited the beggar’s freedom. A more constructive and morally responsible approach would be to give the beggar sufficient money in a lump sum to lift him out of beggary altogether, or else to give nothing at all. No other response was either reasonable, or desirable. Indeed, the latter could perhaps be considered the more advisable course of action as it created an opportunity to promote the beggar’s self-reliance, and, in the long term, his self-empowerment. That said, Hume was still deeply moved to find a fellow human being in such a sorry state and, though pressed for time himself, felt compelled to spare this unfortunate a few minutes and a few encouraging words. Shock number two came when the beggar looked up. It was a young girl. He had naturally assumed . . .
Filthy-looking, her blondish hair a tangle of grime and hardened mud, she had painful-looking scratches on her face and the backs of her hands were ridged with hardened blood. There was a livid bruise where her right eye should have been. ‘Had a good look? Feel better, do you?’ She glared up at him. At the corner of Gilmore Place, Hume glanced back. The beggar girl gave him the fingers. So much for his taking the time and trouble to show compassion. Checking that his essay was still safe and dry in his inside pocket, he crossed the street. There was a spring in his step as he strode through the deluge towards George IV Bridge, towards the new issue of Thought, towards the academic gravy train he could see waiting ahead, waiting for him to climb aboard. My thanks to Kelly at Love Books Group Tours for inviting me to take part. Billionaires’ Banquet is available now and you can order your copy here. 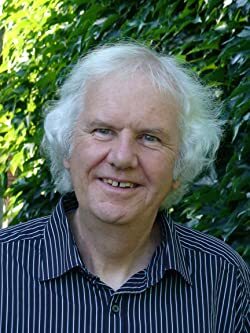 With an international reputation as a prize-winning novelist, RON BUTLIN is a former Edinburgh Makar / Poet Laureate. Before becoming a writer, I was a pop-song lyricist (3 records and a brief appearance in a justly-neglected film. I was also a footman attending parties for the great and good, the rich and bad (see my forthcoming novel ‘Billionaire’s Banquet’), a barnacle-scraper on the Thames and a male model. My work has been widely translated, and ‘The Sound of My Voice’ has been twice been awarded a ‘Best Foreign Novel’ prize as well been made into a film, a rather short film. I am a novelist, poet, children’s author, opera librettist, playwright – one of these, on a good day. I have been auctioned twice for charity, and put in a cage outside parliament for The Day of the Imprisoned Writer. All very character-building. I have given readings world-wide including at the House of Lords, John Knox’s pulpit in St Giles Cathedral, Edinburgh, and an Arab tent in Bahrain. I live in Edinburgh with my wife, the writer Regi Claire, and our dog (Note – Nessie, as she’s called in the book, features in my first novel for early teens, ‘Steve & FranDan Take on the World’ which is out now. She is great fun on paper and in real life).